Usually at this time of year I’d be taking great delight in announcing another attempt at a Comrades Marathon medal, but given there is a delay in the entry procedure actually entering the race won’t be possible for a while. That said the qualifying period has opened and is basically unchanged and at this stage there may be 4 chances for me to post the required sub 5 hour marathon time (or sub 6:00 50km race) to nail the spot down. The following can be seen as my future long term plan that I intend to take so I can get on the start line in June outside the Durban Town Hall. 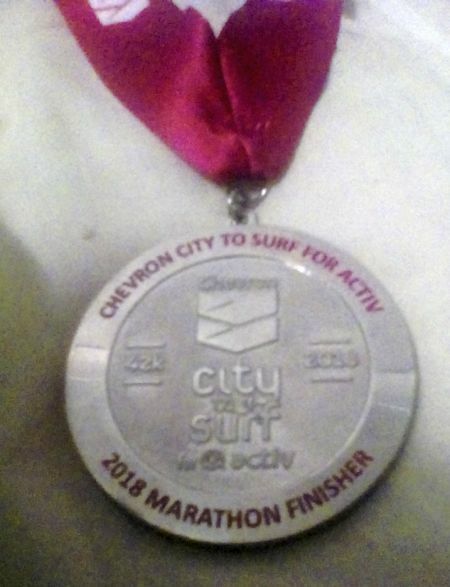 In the last week of August, on the day that Comrades Qualifying officially began, I actually ran the Perth City to Surf marathon for the 3rd time, but the lack of training through injuries and the substantially hillier course that I had encountered in previous years meant that I finished mere minutes outside what would have been enough to qualify me at the back of the pack. Given that it wasn’t my major aim for the year and that it was a mere training run for what’s to come it wasn’t as disappointing as it was on face value, but I was annoyed when I entered the finish chute to look up at the clock and see a 5 as the first digit. I try to get to this event every second year and the work schedule has once again been kind enough to get me here, even though the idea of running this a week after Sydney/Adelaide (whose City-Bay now has a half marathon distance) is still very much in future plans. As usual it will be a little hectic making sure the transport isn’t delayed and that I can easily make it to the start precinct well before the 5PM start time. The hope is to finish well under 2 hours, looking to run 55 minutes/10km pace (5:30kms) reasonably consistently. First priority should really be to finish the event for the 6th time, but this is the event that I’ve earmarked as THE event to get the qualifying time in. The last couple of years I’ve managed to get in about the 4:30 mark despite injury (last year it was persistent calf issues, the year before it was conjunctivitis a week before the event which didn’t go away until the 12 hours before the start), but I’m aiming to run 4 solid 10km blocs to ensure I have a decent buffer to get the sub 4:20 run to qualify for the F start zone. That said I have at this stage have at least Plans A, B and C to combat this puzzle. The initial plan is to look to run reasonably consistent yet slower splits through each 10km phase. The early 55 minute first 10km split is attainable given the pace in the first 7km until hitting the Albert Park lake section of the course is usually quick and that I’m planning nutrition wise to be skipping the drink stations until about the 8km marker. Again if anyone for some reason intends to plan nutritionally in that manner training to run that far without a drink is a must. The splits at 20 and 30 kilometres will depend largely on the wind, in 2016 very strong winds basically put paid to a number of runners getting a quick time, although it had no impact on qualification. Splits 3 and 4 will probably also see me utilise the personal drink stations so searching for the right table may take a little longer. The 4th split also sees a few rises through the botanical gardens on tiring legs so some may think it’s conservative. I’ll probably take it relatively easy on approach to the MCG and will generally take my time unless the time is either approaching or well and truly achieved within the ground. This is a slightly slower plan and may be adapted with Plan A in some regards, particularly with splits 3 and 4 anticipating some walking thrown in. If I can’t remember what times I’m looking for, there’s always the trusty pace groups to count on. Last year I was able to comfortably go with the 4:10 pace group until an unscheduled pit stop approaching the second personal drink station so in theory there’s no reason not to be able to go with them again. In the past I’ve been guilty of attaching myself to groups that have run too fast for what I’m looking for so I have to be careful to actually read what group I’m going with and especially not to panic if I’m losing contact with a group. Confirmed in the last few hours, the entries will open for the big C on this date and will probably sell like hotcakes unlike the previous UP run 2 years ago where I was able to enter 6 weeks after entries opened. Financially I have enough to cover entry and the airfares which won’t be booked until January given I’m waiting to see what options I have. The initial thought is to leave Australia on the Sunday rather than in midweek to spend a couple of days in Cape Town before commuting to KZN (Kwa-Zulu Natal) on the Wednesday, but whether that’s a viable option financially and from what airport I depart from will need to be determined. It’s funny how people get addicted to running marathons so much that 2 weeks after running in the goal race they decide to tow another starting line in a country that they’ve never set foot in (kind of easy when you’ve only taken a step in 3 countries, and Singapore doesn’t really count as I was transiting through the airport). Just how the run will go is something I can’t answer properly but a finish inside 5 hours is something that I can use as a baseline. Getting there has at least been taken care of, and all done without needing to apply for a day off work to do so (unless I get hurt like I did on the Gold Coast but I don’t exactly want to be thinking that way now do I!). The plan will be to finish work close to midday on the Friday after starting at 4AM, although I may even try to negotiate an earlier start time closer to the date. Then it’s basically straight into the shower before dashing to the airport. The 2 hour gap between domestic and international flight is a little tight considering there’s a decent distance between terminals in Brisbane (something I’m going to experience for the first time as my international flights have departed Perth and Melbourne), but I should be in NZ’s best known city around midnight. I also intend to be back in Brisbane at 6:30 Queensland time (daylight savings would have started by then) on the Sunday Night, so I have to be organised with my gear to head straight from finish line to airport via the motel where I’m sure they’ll accommodate a request to mind my clothing. Another year, another trip up Mt Wellington for enjoyment more than anything. Simple plan is to run to the base of the mountain, then converse with walkers on the way past as I make my way to the top. Hopefully the weather will actually be a little colder, as strange as it sounds given it is Hobart, than it was last year when I had to roll up the long sleeves. This will be finish number 5 for me should I make it to the top, which isn’t something to be sneezed at given many locals are either one and done to cross it off the bucket list, or find this challenge (make no mistake, this isn’t an average local fun run) too physically demanding. Again if all goes to plan in terms of getting an entry and staying sound, I’ll be spending this week concentrating on building a good base to train for the big race, and not just Comrades. Training itself will likely start on January 1 or 2 depending on work arrangements. Hopefully this year I’ll be able to do the planned lap of Mt Coot-tha on Australia Day! There are two options on this date, and confirmation of where I’ll be on this weekend will come later this month. Should a ballot result fall my way the plan is to be on the start line for the Tokyo Marathon, one of the 6 majors in Marathon running and in my opinion the easiest for me in terms of affordability and in being successful in the ballot. Based on my assumption that 30000 spots are available and 330000 entered, a 1 in 11 chance of success is a better chance than having a crack at London or New York who have more applicants for more places. If the ballot doesn’t go my way, then I’m hopeful of returning to Wangaratta to do either the half or even their full marathons as a training run for Comrades. Have a suspicion the date will be the week before Easter next year which would make this the 14th of April, but confirmation of this won’t come for a while yet given this year wasn’t done until December. Training run under race conditions will be the plan, although bettering the 5:39 from this year will also be on the agenda. If I can get somewhere near 5:00 it would be amazing and improve my start position should I have not done so already. Of course this all assumes that I won’t be needing to use this race to qualify. Other events may be added (Port Macquarie in March is a possibility, plus there’s the local Rocky River Run in May as a final major training run just to name a couple) and deleted as the time draws closer to the big day….